20 Reasons Why I Store Bag Balm and why you should store it in your emergency preparedness supplies. The product was first introduced in 1899 in Vermont. The formula was purchased by John L. Norris. I have used it for years. I bet I have 10 containers of it. Yes, I am a little OCD when I purchase products I LOVE. My daughters always tease me…”Mom, why do you always buy ten”? Here’s the deal with me, I always worry I will run out. LOL! I just want to be prepared for the unexpected. If I see a fantastic deal on something I will pick up extra to save money in the long run. 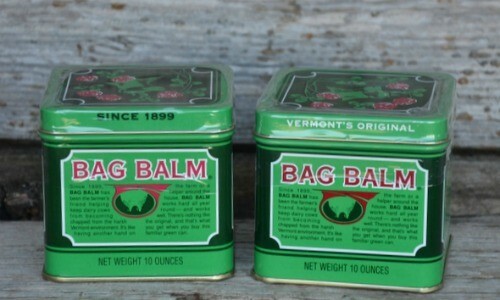 The Bag Balm product was originally used in the cold Vermont winters to protect the cow’s udders from getting chapped. It seems the farmers that applied this to their cows soon realized their hands became remarkably soft after using this lanolin-based ointment. This is when the product soon became popular for human use. Over the years this wonder antibiotic ointment has become useful for so many things. I use it on my Shih Tzu, Boston when his little paws get sore from abrasions. I do it right before bedtime, then he less likely to lick it off. Here are the ingredients in these little cans: 8 Hydroxyquinoline Sulfate (0.3% in a Petrolatum, Lanolin Base) listed on the can. I love to store products that can be used for several things in everyday life, as well as an unforeseen emergency. If you have any ideas I can add to this list please comment and I will add them to the list. Here’s to being prepared for the unexpected! 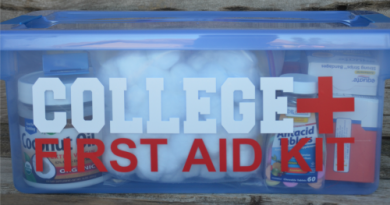 Please check out my first aid kit: First Aid Kits by Food Storage Moms. You might want to make a good first kit for your car: First Aid Car Kit by Food Storage Moms. I had no idea it could be used for all that! I got it to use on my ankles that crack worse then other areas of skin for some reason, and learned it works awesome for dry skin!! I grew up with this in the house! Along with some that you have mentioned, we have used it on our dogs’ ear mites. Both dogs had ear mites and I knew that going to the vet would be costly. 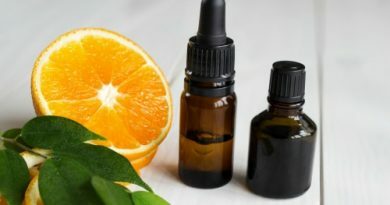 I started to investigate online for a home remedy. I came across someone’s recommendation of using Bag Balm. I thought what the heck it’s antiseptic, let’s give it a try. You will need plenty of Q-tips! Dip one end of a Q-tip into the bag balm, make sure you have the tip coated well. Carefully swab the interior of the ear. Do not go into the canal area, treat it like it was your own ear! You will need to do this once a day for about 2-3 weeks, depending on how bad the dog has it. I love this stuff, too! I started using it 34 years ago, after discovering it is wonderful for diaper rash. My mom and grandma used bag balm for lots of things but, I use coconut oil for all of these things listed. I find it works better and stores just as well. Hi James, coconut oil works great for so many things and it stores really well! We used this stuff at the hospital for Peds with runny stools. As you can imagine, by the time we saw them, the poor babies had been sick at least a few days. Protected and healed those raw, sore little bottoms. My second son was sensitive to diapers, even the unscented – I used this on him all the time. It worked wonders. I didn’t know some of the other things, but it would make sense. 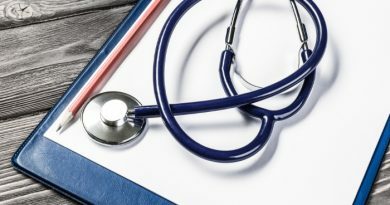 My husband lit some firecrackers one year on the fourth of July and they blew up in his hand…it wasn’t bad, but a few burns….we got home, I cleaned it and covered it with bag balm and wrapped it…the next day it was all healed, wasn’t even barely red…so it works for minor burns also! Great stuff!! Hi, after working in dry cleaning plants for years we have used bag balm for steam burns as well as burns from the hot presses. Works wonderfully. Great tips here thank you, I have three chihuahuas who are always getting into things. So the pet tips will help a lot. 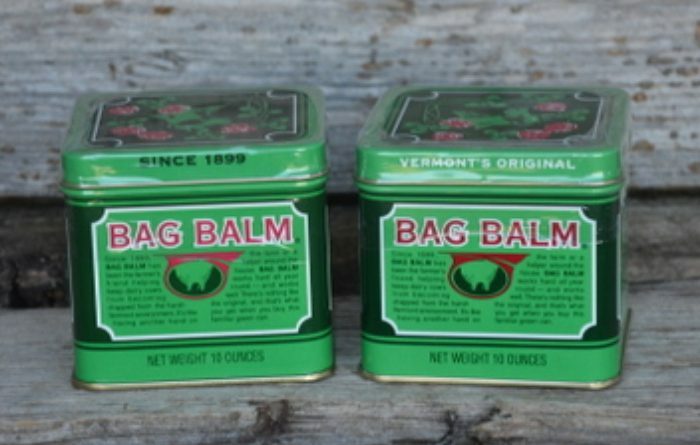 Just ran across this article and as a fellow bag balm lover I thought I’d share my number 1 use for it: to treat active and inflamed pimples and ingrown hairs. I’ve never had major acne problems but every once in a while I will get one of those really painful, invisible, red ones that won’t come to a head or on the bikini line I can get a really painful swollen ingrown hair. Slap a pea size dollop of bag balm on at night, cover with a bandaid and by morning it’s either gone or has come to a head so it can be removed. This is definitely a my mother’s mother mother used this trick and passed it down for generations! I have used this for years on fresh tattoos. Dab it on the fresh ink. Helps keep the itching away and keeps it moist. I have also used this on my residual stump after I lost part of my leg for moisturizer and healing some abrasions. And of course a lot of the previous mentioned ideas. There are some new ones, like the acne. Never thought of that. Thanks for the good read and ideas. Hello. has anyone tried in as a facial “cream”? If it heals chapped hands and heels, what about wrinkles? I’ve grown up using this my entire life. Mom always called it “cow salve.” Got a cut? Cow salve and a band aid. Splinter in your hand? Cow salve and a band aid. Chop a finger off? Cow salve and a band aid. LOL (Just kidding on that last one) It truly is a miracle salve though. Waaaaay back a long time ago, we used a brand that was made with peanut oil. Can’t find that any more. But, this stuff is almost as good. I won’t be caught without it! Thanks for sharing your list of uses!! I use it after I have been doing masonry work. I pulls the lime and cement right out of my skin. It’s also the only thing I use in the winter when my hands start to crack for the cold. I love this stuff. Helps burns or scabs once they are dry. Use bag balm twice a day to prevent scars. Also works on rope burns on horses. Promotes healing.no scarring. I need to buy 10 cans! I’m 65 and been using it for 35 years! Hi Linda, oh my goodness, I had totally forgotten about bag balm. Used it many years ago, but am now going to get it again after reading this. My daughter has extremely dry skin (she has Down Sydrome and this is a common thing) and is sensitive to some ingredients but I bet this will work fine. Thank you for this reminder. Not sure I’ll buy 10 cans though;) Take care. I am diabetic and have very dry skin. I am going to get some bag balm and try. Thanks for the tips. Linda – Thanks for this post. I have been using Bag Balm for years – since my early days. Dad used it on the cows and on his hands as well. I have a large tin to use at home and a tiny tin to carry in my purse. For those who don’t like the smell of Bag Balm, I would suggest a pure lanolin – I found it in the infant department at a local store. No smell, but it doesn’t have quite the healing properties. Always love your posts. They are so informative AND timely. My cat has eye allergies and her eyes are constantly running. Tears collect under her eyes mixed with hair and gunk, I roll a q tip of bag balm on the hair under her eyes and it cleans it right up, soothes it and helps the hair grow back. Lots better than pulling chunks of goo and hair off her face! She loves it, must help the itching.